Remote Control Driving Test game by Merit toys. Homepage. This page: Hours of driving amusement for children in the 1950s. Merit's Driving Test magnetic board game. Being a child can be pretty frustrating at times, especially if you're a car-mad youth desperate to get behind the wheel, and in the 1950s it was no different. While "grown ups" could, funds allowing, learn to drive and go on to own their own car (perhaps after having practiced on machines such as BSM's Prep Driver), the options for a child were limited. Board games such as Merit's "Remote Control Driving Test" would perhaps act as a reasonable stop-gap solution, at least for a few weeks until the novelty had worn off. 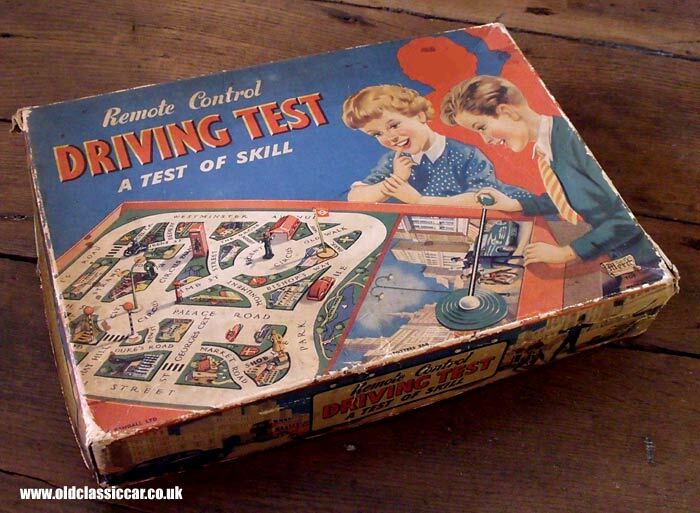 I've seen several different designs of artwork feature on the box, depending on when that version of Driving Test was produced, this though is the early version which looks to date to the mid-1950s. Two happy-go-lucky children are shown, transfixed with excitement. Young Norman (perhaps) tackles Park Avenue using the remote control lever, while his sister Beryl (maybe) watches on, waiting for her turn at the controls. 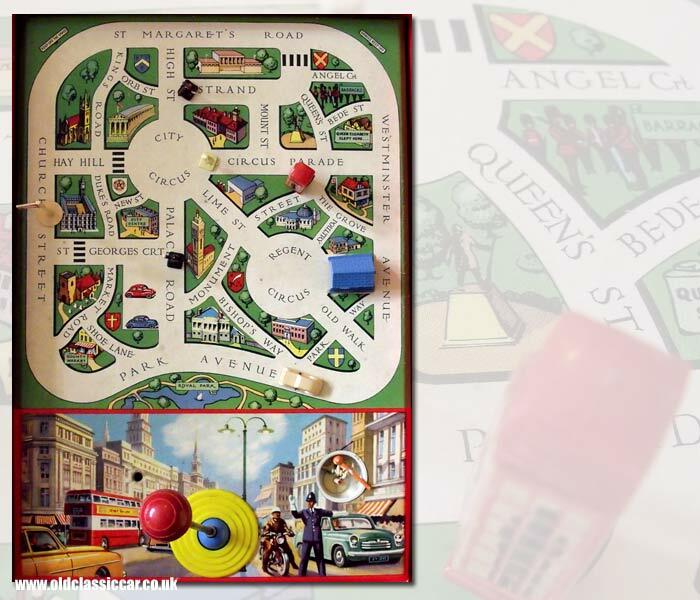 The aim of the game is to negotiate the streets, while avoiding various obstacles, and functions in the same way as the Duncan Hamilton Oulton Park (produced by Bell Toys and Games, who was also responsible for Bell Cross Country Rally) and Merit's own GRAND PRIX racing car games do. All these games incorporate a magnet situated below the board which is under the control of the player(s), so moving the magnet moves the car, which has a metal base. The game board is built into the base of the box. Removing the lid reveals the route that has to be negotiated, while there are small plastic pieces that can be positioned somewhere on the board, all of which have to be avoided. Cars and buses are shown in the illustration at the base of the board, which also shows a police officer calmly directing traffic while a motorcyclist and a gent in a Ford 100E Prefect patiently await their turn. The instructions are printed on the box lid. Insert the Control Lever in the ball joint. This operates the magnet beneath the platform which controls the movement of the vehicle. Obstacles are provided which can be placed along the route, and can be varied as desired for each game or test. It is first of all necessary to make magnetic contact with the vehicle. To do this place the vehicle in the middle of St. Margaret's Road, ease the Control Lever forward as far as it will go, then gently move it sideways until contact is made. Move the Control Lever in the direction you wish to drive the vehicle. The secret of accurate steering is the gentle, almost delicate touch, with which you operate the Control Lever. The course could commence in the middle of St. Margaret's Road for easy contact, but as the players become more skilled the start could be from the Car Park, or more difficult still from inside the Garage. To facilitate steering it is important to keep the playing area perfectly clean. Dusting the map with talcum powder from time to time ensures a smooth surface. The following is the list of obstacles provided which can be placed along the route, and the number of points scored against the driver if any is touched by the vehicle - Phone Box 5; Policeman 20; Newsboy 15; Lamp Standard 8; Belisha Beacon 10; Bus Stop 9; Pedestrian 15; Pillar Box 4; Garage 3. Additional penalties can be incurred such as - not keeping left on Roundabout 2. The narrow roads should only be used by the motor cycles. As many players as desired may take part in this game, scoring as indicated above, so that the winner is the player who completes a specified route with the least number of penalty points. Having just tried out the driving test for myself, I can confirm that it isn't as easy as it might look! Don't forget to also have a look at the very similar Merit GRAND PRIX game.